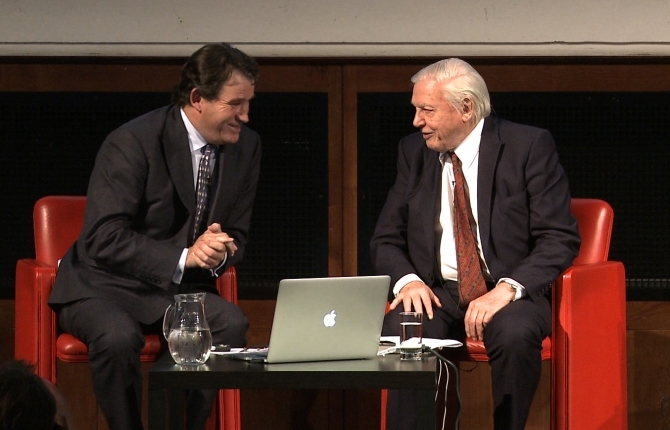 On Tuesday 2nd October 2013, wildlife film maker Alastair Fothergill and WFN trustee Sir David Attenborough treated a full house at London’s Royal Geographical Society to a fascinating and entertaining talk, looking back at their years of close collaboration to create some of the greatest natural history series ever made, including Trials of Life, Planet Earth and Frozen Planet. The talk, packed with classic clips and photos, treated the audience to an intimate and lively taste of their experiences filming wildlife together and bringing some of the world’s most spectacular natural events right into our living rooms. Together they have inspired a generation (or three!) and this was a great opportunity to hear some of the behind-the-scenes stories and adventures they have shared in a collaboration spanning 25 years.